Koda Chrome heading out for his morning work. He made his raceday debut last week, running third in a maiden race. Frame overo thoroughbred Koda Chrome has finished third in his first race start in a six-furlong race at the Beltarra Park track in Ohio last week. Koda Chrome before the start at Beltarra Park last week. Ridden by Cory Orm, Koda Chrome made an early challenge for the lead then settled for third behind Spun Diamond in the maiden special weight race. The three-year-old is trained by Kentucky’s Tom Drury and owned and bred by Karen Babcock of Echo Hill Farm in Kentucky. Babcock owns Koda Chrome’s sire, Blue Eyed Streaker, a bay frame overo stallion with blue eyes. He is by Blue Gazi (Az Igazi) and from Bevs Girl (Gage Line). 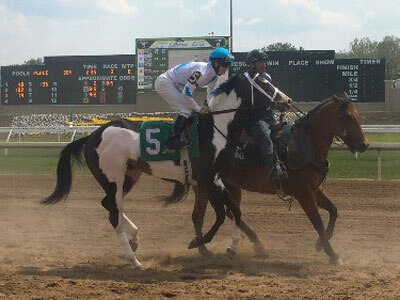 Blue Eyed Streaker is double registered with the Jockey Club and the American Paint Horse Association (APHA). He is one of few remaining breeding stallions who have the Black Toney tail male line. Koda Chrome’s dam, A Beauty in Black, is a black sabino mare by Atticus and from Bankroll Babe. Koda Chrome was born on March 27 and is dual registered with the Jockey Club and the American Paint Horse Association. Tri Chrome, pictured in 1993. A handful of frame overo thoroughbreds have raced around the world in past years. They include US runners Blue Eyed Streaker and Tri Chrome (Blue Gazi x Miss Joslin), who suffered a fatal paddock injury as a young horse, and Ellusive Quest, who had two starts in 2000 before he retired. Koda Chrome, who was named by Babcock in tribute to Tri Chrome, is thought to be the first frame overo to notch up a placing in the US since the early 1990s, when he made his third-place debut on May 7. Koda Chrome showing his frame coloring: the frame pattern is different to tobiano because the base color follows the spine from wither to dock, and white never crosses over.